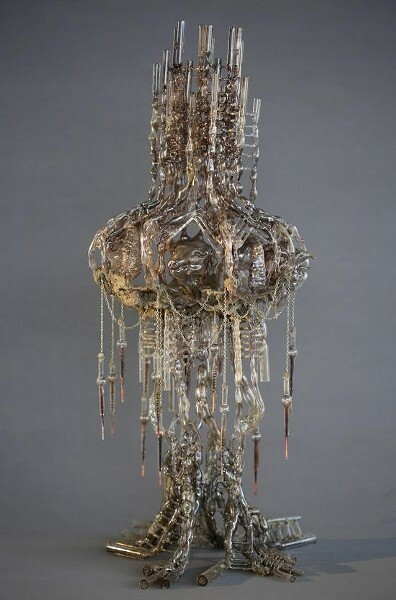 The SCAD Museum of Art presents "Liquid Vessels," an exhibition by SCAD alumna Monica Cook. The exhibition includes recent sculptures and paintings, which further the artist’s investigations into material assemblage, found objects and adornment. Central to the exhibition are Cook’s complex sculptures. These intricate objects appear simultaneously native and alien, as the artist references the natural world through components that appear biological, while transforming recognizable elements into unfamiliar forms through a conglomeration of material. These striking forms, in pale earth tones and pastels, contain an intrinsic fragility, as if decaying.